Although it was originally presented to the artist alone, the award is now presented to the main artist, the featured artist(s), the producer, the engineer and/or mixer and the mastering engineer. 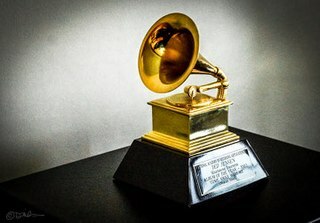 In 1962, the award name was extended to Album of the Year (other than classical) but, in 1965, the shorter name returned. It was not until 1968, 1969, 1999, 2011, and 2014 that the award was won by a rock, country, hip hop, indie and electronic album respectively. As of 2012, classical albums are eligible for this award, with the award for Best Classical Album being discontinued (although no classical album has been nominated in this category since). 2002–2017: Artist, producer, mastering engineer, and recording engineer or mixer. 2018–: Artist, producer, songwriter, mastering engineer, and recording engineer or mixer. Tom Coyne (as mastering engineer) is the biggest winner in this category with four wins. He is followed by Frank Sinatra, Stevie Wonder, Paul Simon (as performers), David Foster, Phil Ramone, Daniel Lanois, Ryan Tedder (as record producers), Bob Ludwig (as mastering engineer), Mike Piersante, Tom Elmhirst, Serban Ghenea & John Hanes (as engineers/mixers) with three victories each. Ludwig, Coyne, Ghenea, and Hanes are the only people to win the award three consecutive years. Paul McCartney leads all performers with nine nominations: five as a member of The Beatles, three for solo albums, and one as a member of Wings. Sinatra leads solo performers with eight nominations, seven for solo albums and one for a duet album. McCartney and Simon are the only artists with nominations in every decade from the 1960s to the 2000s. Thomas J. Coyne was an American mastering engineer. The first woman to win the award was Judy Garland in 1962, for Judy at Carnegie Hall . Taylor Swift and Adele are the only women to win the award more than once for their own albums (winning for Fearless and 1989 and 21 and 25 , respectively; Swift was also nominated for Red ). In addition, Lauryn Hill, Norah Jones and Alison Krauss are all tied with Swift and Adele with two wins overall, each winning as lead artist for their respective albums, The Miseducation of Lauryn Hill , Come Away with Me and Raising Sand (Krauss' collaboration album with Robert Plant); Hill won her second as a producer of her collaboration on Santana's Supernatural (featured artists on non-soundtrack albums did not share in the award before 2008), while the other two also won as featured artists (Jones on Herbie Hancock's River: The Joni Letters and Krauss on the O Brother, Where Art Thou? Soundtrack). Also, for their own albums, besides Swift and Adele, only two female artists have received nominations after previously winning (Bonnie Raitt nominated again for Luck of the Draw and Longing in Their Hearts , after winning previously for Nick of Time , and Barbra Streisand nominated again for People , My Name Is Barbra , Color Me Barbra , Guilty and The Broadway Album , after winning previously for The Barbra Streisand Album ). Judy at Carnegie Hall is a two-record live recording of a concert by Judy Garland at Carnegie Hall in New York, with backing orchestra led by Mort Lindsey. Taylor Swift is also the youngest main artist to win in the category, winning for Fearless in 2010 at the age of 20, surpassing Alanis Morissette's win for Jagged Little Pill in 1996 when she was 21. The Peasall Sisters, Sarah, Hannah and Leah, are the category's youngest credited winners, winning for their contributions to the O Brother, Where Art Thou? Soundtrack at the ages of 13, 9, and 7 respectively. Leah Peasall is the youngest winner of any Grammy in any category. The youngest person to make an appearance on an Album of the Year is Stevie Wonder's daughter Aisha Morris who appeared on "Isn't She Lovely?" off the album Songs in the Key of Life as an infant. Christopher Cross is the first artist to receive the Grammy Award for Album of the Year as well as for Record of the Year, Song of the Year, and Best New Artist in one ceremony. Adele is the first female artist to receive the award for Album of the Year, Record of the Year, Song of the Year, and Best New Artist, nonconsecutively. Only four artists have won both Album of the Year and Best New Artist in the same year: Bob Newhart in 1961, Christopher Cross in 1981, Lauryn Hill in 1999, and Norah Jones in 2003. The Beatles' Sgt. Pepper's Lonely Hearts Club Band was the first album by a rock and roll artist to win, Glen Campbell's By the Time I Get to Phoenix was the first by a country artist, Lauryn Hill's The Miseducation of Lauryn Hill the first by a hip hop artist, Arcade Fire's The Suburbs the first by an indie rock artist, and Daft Punk's Random Access Memories the first by an electronic music artist. Only two artists have won the award in two consecutive years, Frank Sinatra and Stevie Wonder. Sinatra had wins in 1966 and 1967 and Wonder followed with wins in 1974 and 1975. (Lauryn Hill also won as a producer in 2000, after winning previously in 1999 as an artist and producer; Bruno Mars won as an artist and producer in 2018, after winning previously in 2017 as a producer) Wonder and Sinatra both won the most Grammys for Album of the Year within a decade. Sinatra had wins in 1960, 1966 and 1967, while Wonder had wins in 1974, 1975 and 1977. Frank Sinatra, The Beatles, Barbra Streisand, Stevie Wonder, Kanye West, and Lady Gaga are the only artists to receive three nominations for consecutive albums in this category. Gaga and West being the only solo artists to receive nomination for their first three albums. Additionally, The Beatles hold the record for most consecutive years being nominated for Album of the Year, with five. To date, there have been two "live" albums to win the award: Judy at Carnegie Hall and The Concert for Bangladesh , though two "MTV Unplugged" albums (Eric Clapton's and Tony Bennett's) have won the award as well, which were performed in front of an intimate, live audience. One television soundtrack recording was also the very first recipient: The Music from Peter Gunn . Two comedy albums have also triumphed in this category: The Button-Down Mind of Bob Newhart and The First Family . There have been three soundtrack compilation albums that have been successful, as well: Saturday Night Fever , The Bodyguard (though only Whitney Houston won for it as an artist) and O Brother, Where Art Thou?. B ^ Only Houston and the producers of her tracks received the award. Unlike the other two soundtrack compilation albums to win this award, none of the other artists who appeared on The Bodyguard soundtrack (Kenny G, Aaron Neville, Lisa Stansfield, The S.O.U.L. S.Y.S.T.E.M., Curtis Stigers, Joe Cocker, Sass Jordan, and the uncredited instrumental ensemble that performed Alan Silvestri's theme) shared in the award, nor did the producers of those tracks (other than Cole, Foster & Clivilles who also produced some of Houston's tracks). The Latin Grammy Award for Record of the Year is an honor presented annually at the Latin Grammy Awards, a ceremony that recognizes excellence and creates a wider awareness of cultural diversity and contributions of Latin recording artists in the United States and internationally. The award is given to the performers, producers, audio engineers and mastering engineer for new songs in Spanish or Portuguese language. The songs included on an album released the previous year of submission are also eligible only if they have not been submitted to competition before. Instrumental songs are also eligible. Due to the increasing musical changes in the industry, from 2012 the category includes 10 nominees, according to a restructuration made by the academy for the four general categories: Song of the Year, Album of the Year, Best New Artist and Record of the Year. Throughout the history of the Grammy Awards, many significant records have been set. This page only includes the competitive awards which have been won by various artists. This does not include the various special awards that are presented by the National Academy of Recording Arts and Sciences such as Lifetime Achievement Awards, Trustees Awards, Technical Awards or Legend Awards. The page however does include other non-performance related Grammys that may have been presented to the artist(s). 1 2 "Overview". National Academy of Recording Arts and Sciences . Retrieved March 16, 2011. ↑ Lynch, Joe (February 19, 2016). "Taylor Swift Joins Elite Club to Win Grammy Album of the Year More Than Once: See the Rest". Billboard. ↑ Aswad, Jem (2018-06-28). "Grammys Expand Major Category Nominations From Five to Eight". Variety . Retrieved 2018-12-09. ↑ "Grammy Awards Nominees 1966 – Grammy Award Winners 1966". www.awardsandshows.com. Retrieved April 26, 2017. ↑ "Grammy Awards Nominees 1967 – Grammy Award Winners 1967". www.awardsandshows.com. Retrieved April 26, 2017. ↑ "Grammy Awards Nominee 1975 – Grammy Award Winners 1975". www.awardsandshows.com. Retrieved April 26, 2017. ↑ "Dan Auerbach, Fun., Jay-Z, Mumford & Sons, Frank Ocean, Kanye West Lead 55th GRAMMY Nominations" . Retrieved 24 March 2013. ↑ "Grammys 2014: The complete list of nominees and winners". Los Angeles Times. January 26, 2014. ISSN 0458-3035 . Retrieved April 26, 2017. ↑ "Grammys 2015: And the Winners Are ..." Billboard. Retrieved 8 February 2015. ↑ "61st Annual GRAMMY Awards". GRAMMY.com. Retrieved December 7, 2018.